The very first album I ever owned was Michael Jackson's "Thriller." To give you some indication of my age, I had it on vinyl. I remember being scared as hell watching the video on MTV as a little girl, but at the same time feeling compelled to watch it. 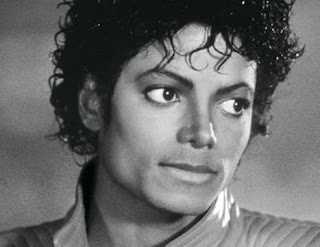 There was just something about Michael Jackson that demanded your attention. Whether it was his moonwalk, forever immortalized in the video to "Billie Jean," that single sparkly white glove, or the way his voice could hit notes you didn't even know existed, the man was larger than life. I know some of you are sick about hearing about Michael Jackson. But you have to understand -- this man was a musical giant for so many of us growing up. Not even Madonna (whom I adored and wanted to be as a little girl) could reach the great heights that Michael did. And for all the notoriety he received in his too-short life, we cannot ignore the many gifts he has given to society. His musical legacy has inspired so many artists, from Justin Timberlake and Usher to so many more. Michael Jackson is the Guinness world record holder for the most money donated to charities by a popstar. In my book, that counts more than all the records he broke for albums sold. Today was the Memorial Service for Michael Jackson. It was such a moving service. I found myself getting teary-eyed at many parts, most especially at the end when Michael's daughter Paris got onstage to say goodbye to her father. I've posted video clips of my favorite parts of the memorial service below along with a playlist of my favorite songs by Michael. I hope they will encourage you to celebrate the living legend that was Michael Jackson. "The meaning of life is contained in every single expression of life. It is present in the infinity of forms and phenomena that exist in all of creation. In a world filled with hate, we must still dare to hope. In a world filled with anger, we must still dare to comfort. In a world filled with despair, we must still dare to dream. And in a world filled with distrust, we must still dare to believe." I remember listening to ABC as a kid, even though at the time it was a pretty old song. And I love Thriller and Man in the Mirror. They're my faves. And for all the notoriety he received in his too-short life, we cannot ignore the many gifts he has given to society. My very favorite post of yours so far! I was a true #1 Michael Jackson fan, and I have been surprised at how sad this has made me considering he was just a celebrity. thanks for the clips. i watched the one where Paris speaks and it made me cry. sheesh!